Searching for planets around other stars is a tricky business. They’re so small and faint that it’s hard to spot them. 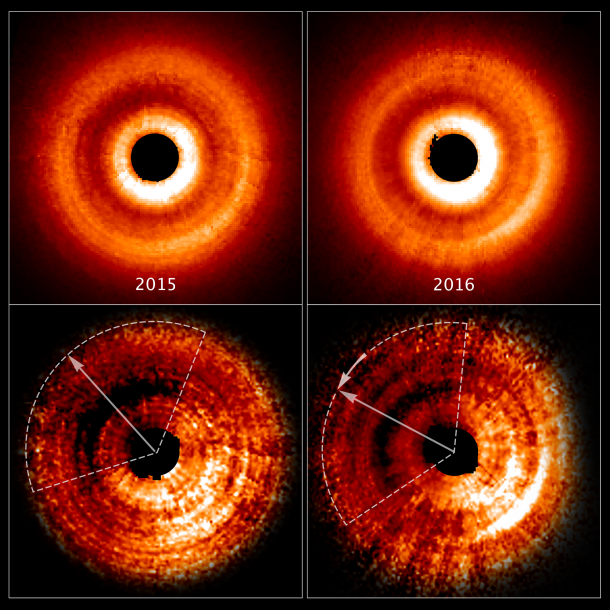 But a possible planet in a nearby stellar system may be betraying its presence in a unique way: by a shadow that is sweeping across the face of a vast pancake-shaped gas-and-dust disk surrounding a young star. The planet itself is not casting the shadow. But it is doing some heavy lifting by gravitationally pulling on material near the star and warping the inner part of the disk. The twisted, misaligned inner disk is casting its shadow across the surface of the outer disk. 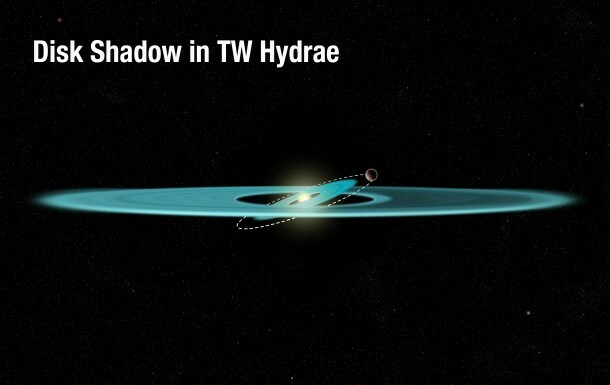 A team of astronomers led by John Debes of the Space Telescope Science Institute in Baltimore, Maryland, say this scenario is the most plausible explanation for the shadow they spotted in the stellar system TW Hydrae, located 192 light-years away in the constellation Hydra, also known as the Female Water Snake. The star is roughly 8 million years old and slightly less massive than our sun. The researchers uncovered the phenomenon while analyzing 18 years’ worth of archival observations taken by NASA’s Hubble Space Telescope. Debes will present his team’s results Jan. 7 at the winter meeting of the American Astronomical Society in Grapevine, Texas. Debes’ first clue to the phenomenon was a brightness in the disk that changed with position. Astronomers using Hubble’s Space Telescope Imaging Spectrograph (STIS) first noted this brightness asymmetry in 2005. But they had only one set of observations, and could not make a definitive determination about the nature of the mystery feature. Searching the archive, Debes’ team put together six images from several different epochs. The observations were made by STIS and by Hubble’s Near Infrared Camera and Multi-Object Spectrometer (NICMOS). STIS is equipped with a coronagraph that blocks starlight to within about 1 billion miles from the star, allowing Hubble to look as close to the star as Saturn is to our sun. Over time, the structure appeared to move in counterclockwise fashion around the disk, until, in 2016, it was in the same position as it was in images taken in 2000. This 16-year period puzzled the researchers. They originally thought the feature was part of the disk, but the short period meant that the feature was moving way too fast to be physically in the disk. Under the laws of gravity, disks rotate at glacial speeds. The outermost parts of the TW Hydrae disk would take centuries to complete one rotation. The research team concluded that whatever was making the shadow must be deep inside the 41-billion-mile-wide disk, so close to the star it cannot be imaged by Hubble or any other present-day telescope. The most likely way to create a shadow is to have an inner disk that is tilted relative to the outer disk. In fact, submillimeter observations of TW Hydrae by the Atacama Large Millimeter Array (ALMA) in Chile suggested a possible warp in the inner disk. Given the relatively short 16-year period of the clocklike moving shadow, the planet is estimated to be about 100 million miles from the star — about as close as Earth is from the sun. The planet would be roughly the size of Jupiter to have enough gravity to pull the material up out of the plane of the main disk. The planet’s gravitational pull causes the disk to wobble, or precess, around the star, giving the shadow its 16-year rotational period. Recent observations of TW Hydrae by ALMA in Chile add credence to the presence of a planet. ALMA revealed a gap in the disk roughly 9 million miles from TW Hydrae. A gap is significant, because it could be the signature of an unseen planet clearing away a path in the disk. The Hubble Space Telescope is a project of international cooperation between NASA and the European Space Agency. NASA’s Goddard Space Flight Center in Greenbelt, Maryland, manages the telescope. The Space Telescope Science Institute (STScI) in Baltimore, Maryland, conducts Hubble science operations. STScI is operated for NASA by the Association of Universities for Research in Astronomy in Washington, D.C.